Improve customer satisfaction with quick, efficient and cost-effective service. 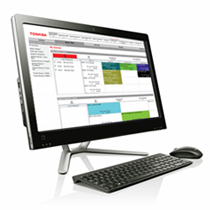 The Toshiba Contact Center Suite runs as an application on Toshiba’s Media Application Server (MAS) or MicroMAS to create simple yet powerful contact centers. Connect your Strata CIX or IPedge system to a MAS or MicroMAS to efficiently manage incoming calls to departments and other groups, optimize contact center operations, and increase customer satisfaction. Gain sophisticated capabilities such as skills-based routing, balanced call counts, time and depth in queue announcements, priority queuing and more. Contact center agents can be anywhere. 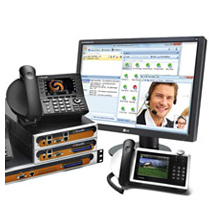 The automated call distribution (ACD) application treats multiple locations as one system. The system checks agent status in other locations before routing to those agents. Call Manager functions such as presence status and Chat extend over the network. Remote or mobile contact center agents can even use their smartphones as extensions of the business phone system. Website visitors can initiate a text Chat session with a contact center agent or request a callback. When a representative is available, the system automatically calls the customer. The optional Call Manager application puts call-handling and text Chat features onto a graphical PC interface, ideal for high-volume agents. Get screen pops with incoming calls through integration with popular customer relationship management programs such as SalesForce.com®, Act!,® Microsoft® Outlook™ and others. Call statistics and management reports on everything from agent performance to forecasting tools and scheduled reports are conveniently accessible from anywhere via a browser-based interface. 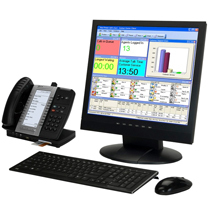 Call recording and logging systems can help improve operations, from training and quality control to customer service. Record, store, organize, and play back calls to avoid communication disputes that can result in business liabilities. Improve customer access to the contact center and provide better service, while reducing hold times and operating costs.